What did you like about the book? Joni lives on a sheep farm in rural Vermont and can’t wait for summer; she’s planning to ride her pony, Archie, every day to get ready for horse camp and spend lots of time with the new kittens on her family’s farm. Then a new girl moves next door right before the end of school. Francesca Chess, is from California. She is vegan and has strong opinions about how animals should be treated. Chess doesn’t believe in owning animals and is especially offended by a neighbor, Mrs. Abernathy, who has her mini ponies pull her around in a cart. Joni and Chess start a complicated friendship; sometimes they have fun together, but Joni is uncomfortable with many of Chess’ ideas. This is not the summer Joni expected. When Chess’s ideas lead to action, she ends up putting animals in even more danger. Will Joni and Chess ever see eye to eye? I just loved this book! I’m not even a horse person usually, but the ethical dilemma of animal rights versus the reality of farming life is so perfectly portrayed here. Readers will be fascinated by the implications of Chess’s ignorance and the danger of misinformation. Both girls grow and change by the end of the book and the conflict resolves in a very realistic way. This is a must-buy for all elementary and middle school libraries; so many kids will find this one interesting and engaging. To whom would you recommend this book? Animal lovers, horse lovers and students who want to learn more about animal rights will all like this book. Anything you didn’t like about it? Nothing; it’s wonderful! Who should buy this book? All elementary and middle school libraries. Should we (librarians/readers) put this on the top of our “to read” piles? No, but it’s a great read! 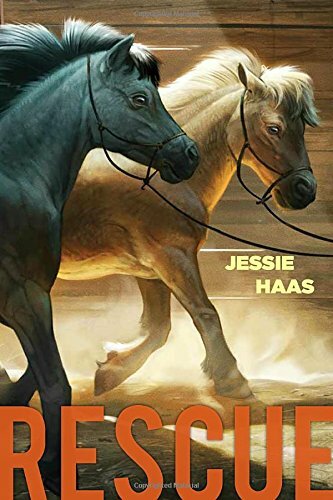 This entry was posted in *Starred Review, Animal fiction, Book Review, Horses, Realistic fiction and tagged Boyds Mills Press. Bookmark the permalink.